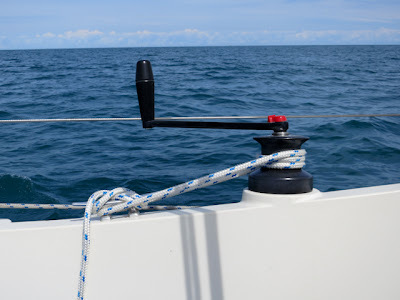 I was looking at the winches today while on an absolutely amazing day sail trip, and it dawned on me that I really am going to need to put a tilted pad under these things. That line is really not fair at all. Although it stays in place, it's the sort of minor design flaw that just subtly eats away at me until I fix it. Not to worry though, this will occupy a low spot on the priority list! Still have a bunch of projects to finish first. I'm making some headway with the holding tank mounting structure, albeit very slow. I have obtained a new fresh water pump, but haven't picked its mounting location yet. And I still need to install my Nicro solar vent... Plenty to keep me busy before I go making trouble with the winches!